Carlow Graphics – renowned and award-winning experts in the field of graphic design, shop fitting, and sign making (based in Carlow) – were valuable existing clients of New World Digital, and our two firms had enjoyed a mutually beneficial relationship over a number of years. 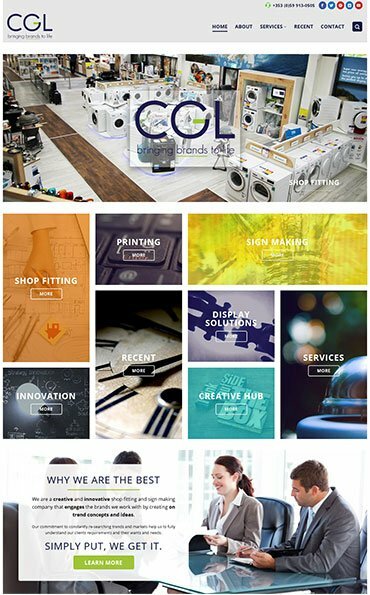 They chose to re-brand as CGL Retail Solutions, to greater emphasise that their services are about much more than mere graphic design. They took the opportunity to also give their website a complete overhaul – and that’s where we came in. This project was very design-oriented, and with that being the client’s specialist field, they took a greater role in the creative process than is normally the case. We guided them towards a menu structure to best showcase their range of services and previous work for such household names as Easons, Arnotts, Shaws, and several electrical goods manufacturers and retailers. We liaised on text content and honed draft material composed by them into snappy, dynamic online copy, to ensure an effective verbal message stood out to portray all their experience and expertise. We received mock-up documents from CGL Retail Solutions of how they would like the site to look, and we set about meeting the challenge of translating those static documents into dynamic website content that would be effective on all screen sizes. Our senior web designer/developer painstakingly analysed all mock-up documents and client requests for how images and other elements would behave on-screen. These included scrolling, zooming, and transforming from in-focus to out-of-focus depending on cursor position. He devised perfect solutions to all these requests, delivering the results required without unnecessarily adding to the loading time of the site. An additional innovation was use of the ‘lazy loading’ effect – which means that elements of the website load first only for the part visible on a user’s screen, with other elements then only loading as the visitor scrolls towards them. This too effectively speeds up the website. Another bonus for the client was the use of a filter facility for the portfolio section of the website, again using various sliding and animation effects to make the site feel more alive and interactive. As with all website designs and builds, full attention was paid to SEO considerations at all stages, so that the client’s site would continue to rank highly for all key terms in their industry. Overall, we delivered a highly visual, feature-filled, design-oriented site that both the client and ourselves can be proud of. You can see the end result at CGL Retail Solutions. Prepare to be dazzled!